Welcome to the Altenew November 2017 Release Blog Hop! This is a huge hop with tons of talented artists. If you're just popping in, you'll definitely want to head over to the Altenew Scrapbook Blog to start from the very beginning. If not for the inspiration than definitely for the giveaway! Altenew is giving away a $50 gift certificate to SIX lucky winners! Please leave a comment on the Altenew Card Blog and Altenew Scrapbook Blog by Thursday, November 16th for a chance to win. 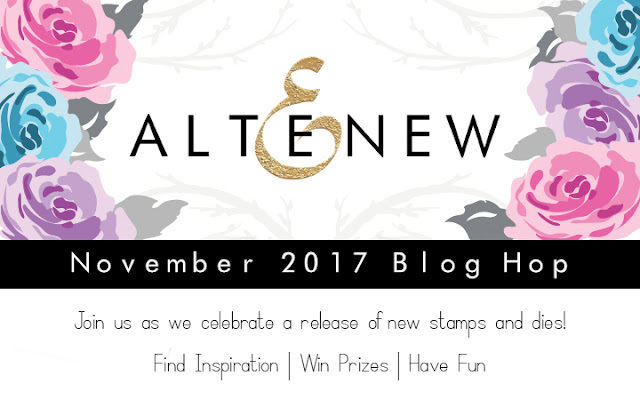 Six winners will be announced on theAltenew Card Blog and Altenew Scrapbook Blog on Saturday, November 18th. The winner will be posted on November 16th so make sure you first leave some love and then stop back to see if you're the lucky winner! You probably noticed both Altenew's Card Blog and Scrapbook Blog are included in the hop list. Why is that you ask? Well this release has something for both kinds of crafts! For today's card I used both the new Golden Feather stamp and die as well as the new Forever and a Day stamp and die. I took the title literally haha. Lots of gold heat embossing! I first stamped the feathers in Versamark and heat set them with white embossing powder. Next I stamped the detail layer and heat embossed them in gold. For a bit of color I smooshed some distress oxides onto my craft mat and sprayed them with water before dragging my feathers through to add a subtle color blend. The branch was stamped and sprinkled with gold embossing powder. Once I die cut it I colored the whole piece with my ink pad and added a teeny tiny bit of shading with my Copic markers. If you'd like to see the whole card from start to finish you can watch it in the video below! I love your card, Kelly... the branch is so cool and I can see so many options with it. Great release, love your project! Especially the Golden Feather Stamp set! Love this new release. And your card is amazing; love the feather stamps/dies. Such a fun card with lots of details! It makes me smile! Thanks also for telling us how you did it! oh the feathers are so pretty!!! Fantastic! Love your cards. Thank you for sharing and have a wonderful day. This is absolutely stunning! :) It is soft and bold at the same time :) TFS. Love your beautiful gold embossed feathers. WOW! CAS and Elegant Creative Work of Art! Beautiful and Well Done! Great Job! Love your beautiful card with it's glitter and shine. You used one of my favorite sets (Forever And A Day) in your design as well! Such a great release. I love those feathers. Very pretty card!! I have been looking at feather stamps for a while more and just haven't decided about purchasing one. I did like the fact that there is a couple layers in this set! Simply gorgeous! Love the feathers! Beautiful card. I love the feathers. Thanks for sharing.. The added gold is fabulous!!! Beautiful card; love the Golden Feathers set. Beautiful card. Love how you combined white and gold embossing powders on the feathers; great effect. I really love this card. I am just getting started with heat embossing and watercolor and distress inks ....and having so much fun. Can't wait to try out the feather...thanks for inspiring me to create and think out of the box!!!! Beautiful card, love the gold embossing with the DOX ink colors! Golden Feather set is my favorite. Fabulous card!! LOVE the feathers!! I really like your branch in all its permutations! (Well I like the first one best before. . .) Very cool to watch it all come together. Love your beautiful ideas for this release! What a wonderful card design! Love how you incorporated the vine with the feathers, and of course, all the gold! Lovely card and I love the feathers. Thanks! Pretty card. Love the design! I adore the design of your card!!! STUNNING!! Such a beautiful card and awesome new release!!! I just can't get enough of these feathers! Love how you used them! Can't wait to continue on this hop. My wish list is groooowing! I love the gold heat embossing and these beautiful feathers! Thank you for the inspiration! This is such a fun way to combine these new sets from Altenew. I love the new feathers and that sentiment always makes me smile! Hi Kelly! I love the card you made! I love the feather stamp set but I never know how to use feathers either in my scrapbooks or cards. Thanks for the inspiration! Beautiful card Kelly, TFS. Love those feathers:). So beautiful with the gold embossing. I just love your card! Love feathers and love gold, what a great combination. I just love seeing pale colors with gold embossing. I love your videos. So, o don’t think I’ve seen a video without comics and I was a tad relieved when you started using one. Lol! I’m so craft OCD it’s insane! Great card, love watching your creative process. You are so talented! Thinking of all the things I wouldn't like shading on the branch .... beautiful! I just love your card and that stamp set. It's amazing to see all of the different ideas that everyone is coming up with using this set. Gorgeous design. The gold embossing is wonderful. Your card is very elegant with the gold embossing and the colorful feathers. Thanks for sharing. LOVE your feathers and golden embossing, TOTALLY INSPIRED by your CREATIVE design with the branch! Oh Kelly, how do I love thy voiceovers? Let me count the ways. I mean, Laura Bassen is a verb and you have a plan for if you die mid-crafting--what more does a girl need? But lest you think I love you for just the color commentary, I really do appreciate your art. You have such a unique style, and you are an excellent teacher. I can't tell you how much I've learned just listening to you (hilariously) describe your process. Thank you for that, thank you for helping show us the versatility of this new set, and thanks for just being you. What gorgeous gold accents on those fabulous feathers! I am going to have to get that stamp set and dies! Beautiful card with stunning feathers. Thank you for sharing those beautiful shiny gold embossed great feathers!! Love the card and especially the gold. Thanks for sharing. Loving the gold accents, especially on the branch, it looks so dimensional! Oh Kelly, this is beautiful! Wonderful card, love the honesty and the fix. This card would be easy to duplicate over and over to give as a card set. Beautiful. Simply stunning!!! I love the gold!!! I love the embossing on the feathers! I love your beautiful design and the colours with gold! This is a fun sentiment too. Love your card and the touches of gold make it really elegant. The Golden Feather set is beautiful and the way you embossed in both white and then gold is stunning! Those feathers look awesome with the gold embossing powder. Great job! These feathers are gorgeous in gold. Thanks for the inspiration. Great card as always, love the feathers. Thank you, never get tired of watching your videos. Wonderful card! I love the addition of the gold embossing. Love your card and that feather stamp set! Beautiful card, I love the look of the gold embossing. So pretty - love the gold embossing. Very nice, thanks for the inspiration!